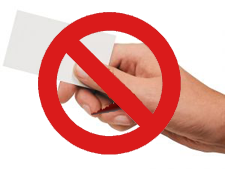 Last summer, I wrote a lengthy rant against business cards, calling them “virtually useless as one of the last bits of information that we pass non-digitally”. Ten months later, I couldn’t agree with myself more. Just like the handshake, the business card is an annoying relic of the past. Each card I get joins a ridiculously large pile on my dresser that has become effectively useless (the only exception are the cards made out of beef jerky). Sure, I could get a business card scanner and digitize them, but the point is that I shouldn’t have to. Bump Technologies is a mobile application developer that’s looking to offer a solution, allowing users to transfer their contact information simply by tapping their phones together. And things are looking bright for the small startup — the company has just raised a seed funding round from Y Combinator, and is quickly building up a sizable user base. Bump currently offers an application on the iPhone, with plans to release apps for Android and other mobile smart phones in the near future. Using the app is fairly straightforward: you launch Bump (as does the person who you’d like to swap information with) and tap your phones together. Once their accelerometers are activated, the phones both relay their current location data to the cloud, and Bump’s servers determine when there’s a match. Finally, a photo of the contact you’re pairing with shows up on your screen, and you confirm that you’d like to exchange data. It may sound a bit complicated, but it only takes a few seconds. Bump isn’t the first application to do this (Tapulous’s Friend Book has been doing this since soon after the App Store’s launch), but it’s a good idea nonetheless. At this point there are some obvious flaws — if you don’t have a cellular connection, it won’t work, though Bump plans to fix this is an upcoming version by also allowing users to transfer data using the iPhone’s Peer-to-Peer Bluetooth functionality. And for the time being you can only share data with users that have an iPhone and have the Bump app installed, which leads to a classic chicken-and-the-egg problem. That said, Bump is off to a good start. The app currently has 940k users, and 140k of them have already upgraded to the new update in the two days since its release, which means a significant number of them are very active. The latest version adds the ability to transfer photos along with contact info, and Bump will eventually allow you to transfer any kind of data — eventually, it will even allow you to transfer money, which could be huge. I’m glad Bump, as well a few other companies like Nameo and Me2, are seriously trying to solve this problem. But frankly it’s ridiculous that phone manufacturers can’t agree on a wireless standard for quick data transfer that just works, without any extra applications or an annoying pairing process (seriously, Palm worked this technology out ten years ago). It doesn’t look like that’s going to happen any time soon though, so Bump may well have a bright future ahead of it.